Image courtesy of Library of Congress Though he was first elected at age 22—younger than the constitutionally required age of 25—the House chose to seat William Charles Cole Claiborne of Tennessee in the 5th Congress (1797–1799). On this date, William Charles Cole Claiborne of Tennessee, the youngest person ever elected to the House of Representatives died. Born in Sussex County, Virginia, in 1775, Claiborne worked as an assistant for John Beckley, the first Clerk of the House of Representatives. Claiborne later studied law in Virginia and became a criminal attorney in Tennessee. Governor John Sevier of Tennessee—a former Congressman from North Carolina who later represented Tennessee in the House—appointed the 21-year-old Claiborne as a judge on the Tennessee state supreme court in 1796. The next year, Claiborne earned a seat in the U.S. House of Representatives when he was elected as a Jeffersonian Republican to complete Andrew Jackson’s term in the 5th Congress (1797–1799). As only the second Congressman to represent the new state of Tennessee, Claiborne, elected at the age of 22, failed to meet the constitutional age requirement of 25 years. 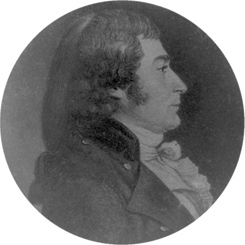 He also won election to the 6th Congress (1799–1801) at age 24, but the House chose to seat him in both instances. During his brief tenure in Congress, Claiborne served on the Ways and Means and Elections committees. Claiborne did not seek a third term in the House; in July 1801 President Thomas Jefferson appointed him Governor of the Territory of Mississippi. He later served as Governor of the Orleans Territory and as Governor of Louisiana. Claiborne’s rich political lineage included several family members who served in the House of Representatives: Nathaniel Herbert Claiborne of Virginia; Thomas Claiborne of Virginia; John Francis Hamtramck Claiborne of Mississippi; James Robert Claiborne of Missouri; and Corinne Claiborne (Lindy) Boggs of Louisiana.